As our world spins ever faster, we need to keep adding hyphenates to flourish. Mat Gleason is a Los Angeles art gallery owner-dash-art writer who can now add game show judge-dash-art expert to his professional designation. In our modern life, one must ride with every opportunity that comes our way. 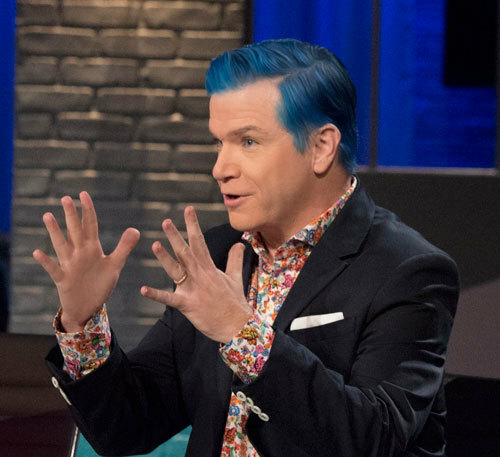 Mat Gleason is now a judge on Skin Wars: Fresh Paint, a body art competition hosted by RuPaul on the Game Show Network. Competing artists use the human body, painterly skills and clever visual trickery to create artistic masterpieces. Gleason must furrow his brow and exercise the greatest of his sensibilities to judge a winner. Easy to spot in a crowd, Gleason has a head of blue hair. His grin is wide and his eyes sparkle a little too mischievously. Gordy Grundy: Tell us about your art gallery, Coagula Curatorial. Mat Gleason: My gallery is in Chinatown. It allows me to curate what I like, give good artists chances, take gambles on artists that LA needs to see. The overhead is low so sales are not my priority, but they sure are nice. GG: What do you do at the gallery? How do you spend your time? MG: Curate, curate and then all the business side of things. But it is two-thirds the fun stuff so I will stick with it. Give us a typical day in your work life. A lot of it is interacting with artists, working out ideas. The shows that end up at my space have a collaborative energy with the artists. I wrote criticism for years and now I put my money where my mouth is. And then I end up taking art collectors and other interesting people out to lunch. There are a lot of new good restaurants in Chinatown in L.A. It is still about three-quarters slum too, so you can see things like slabs of bacon drying on a wall in an apartment building near laundry drying on a balcony and then walk two blocks to a place that Jonathan Gold raves about being one of the greatest places to dine in LA. How did you get selected to be a judge? I had done some YouTube videos with Eric Minh Swenson talking about the art world and issues facing artists and some with Juri Koll directing me to comment on how artists can "make it" in the art world. Jill Goularte, a producer from Skin Wars: Fresh Paint was looking for an art critic and came across the videos and tracked me down for an audition. How does your fine art expertise relate to body painting? Art is art. What are we looking at and what are the merits here? The other judge, Emma Cammack, is a body painting expert. I look at these with the same eye I would look at a painting or sculpture. What are your thoughts on the current season of the show? The premise of Skin Wars: Fresh Paint is to have fun and I get to talk about art while doing it. The art world takes itself so seriously, they label anything fun as "whimsical" and are totally suspicious of it. Meanwhile artists are some of the funnest people to be around. Maybe time will change that. Do you have any behind the scenes, backstage stories for us? On the first day of shooting, dozens of people are walking up to me and introducing themselves and I was getting overwhelmed and I ask my handler "Am I supposed to remember everyone's name?" and she says, "No, you're the talent, they have to know your name but you don't have to remember their names." Her name was Susan, thanks Susan! Do you have any dish on RuPaul? Ru was great to work with, a real professional. His dressing room was the furthest one down the hall so you didn't go back there, but then after each shoot, he would walk down the hall to his car and say goodbye and hugged people, it was like his catwalk for the cast and crew and every head would pop out of every door and high five him, hug him and we'd all just bask in the glory of being around Ru. Unlike me, it appeared he knew the name of every crew member. 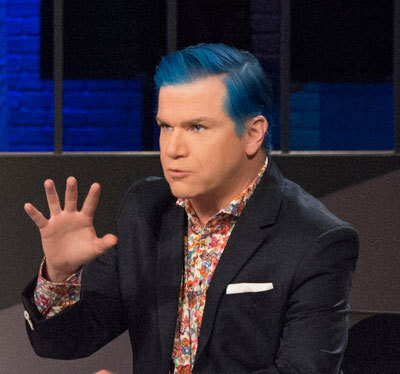 With your wild blue hair and swift wit, you seem a lot more interesting than the contestants. The Skin Wars audience is interested in the artists and the art and RuPaul. There is a hierarchy of why they tune in. If you were given a reasonable budget to produce a fine art TV show, what would you do? Let the artists talk and the art speak without the artspeak. I wonder, could you host a talk show? You'd be great. What would you talk about? What type of guests would you invite? I host a live streaming web show Modern Art Blitz. We stream Sunday afternoons at 5 PM (PST) at Dromebox.com and episodes are archived at ModernArtBlitz.com. We talk art with artists and other important people in the world of contemporary art. Is body painting fine art? Not really, but that might be the best thing about it. What type of art shows excite you? I'm partial to anything that disrupts perceived norms but so is every smug prick in the art world and they of course overdo this and the first thing they dump is the form and they make a critique of the form and so I caveat my preferences by insisting on something made well first and foremost. Deskilling bores me to tears. Mat, give us a typical day in your personal life? I take Mondays and Tuesdays totally off, spend them at home with my wife and dog. I end up doing a little work online and running errands but if I don't leave the house between Sunday night and Wednesday morning, the batteries are quite recharged. Who is your sweetheart Leigh Salgado? What kind of art does she make? My wife is an artist. She cuts paper. She is well-known and well-collected in Los Angeles. She embraces the feminine as subject matter and has mastered a still-radical art-making method of literally drawing with a knife. What part of town do you live in? What's it like? I've lived within five miles of Downtown Los Angeles at almost all times since 1986. It is a constantly changing festival of possibilities and my gringo Spanish comes in handy a lot. What are your thoughts on Los Angeles? If all of the media in the United States was not centralized in New York, L.A. would be the capitol of the world. Besides the glitz and glamor, what are some of the challenges in your life? I had to get a pacemaker a few years ago to correct a childhood congenital heart condition, so I have to take pills and exercise and not drink coffee and you either embrace life and get with the program or you don't, so the challenge is actually the roadmap to staying alive. Most importantly, do you have any pets? I adopted a junkyard dog from a shelter, Aybar, named him after my favorite baseball player. Had we adopted him thee years later his name would be Trout. Can fine art be judged as a competition? Absolutely. Even better, though, is that the results of the competition can be judged by history and re-assailed every half-century. Every museum purchase is a competition won by the artwork bought and lost by every other artwork. Will body painting art make its way into the museums? What's it really like to own an art gallery? It is like caretaking a safe space for free speech. This whole system hangs by a thin thread of set agreements. Anything goes within these walls, but it has to go well, get it? The fiinal episode of Season One of Skin Wars: Fresh Paint airs Wednesday, August 3 at 9 PM (Eastern and Pacific) on GSN, the Game Show Network. Gordy Grundy is an artist, arts writer and creative producer. His visual and literary works can be found at www.GordyGrundy.com.